TEMPbadge identification badges and badge accessories are excellent for tracking visitors such as temporary workers, vendors, guest speakers, and volunteers. These amazing expiring badges and accessories fade visually, indicating the end of the time of an approved visit. You never have to hunt down your guest and collect the badges; they simulate fade and the guest can just toss them. Choose from a wide array of colors and styles to meet your needs, and increase your security with a secure, effective and affordable TEMPbadge visitor system from MyBinding.com today. Size: 1 15/16" x 2 7/8"
Transcript: Tracking visitors can be a difficult task. Log books and manually badges have been used for decades, but they don't provide a way to easily access information on past visitors. Sophisticated access-control systems can control every aspect of your identification program, but still can't prevent the badge from being used more than once. TEMPbadge, self-expiring badges are the answer. They use patent technology to visually identify badges that are no longer valid. The front part is applied to the back part to activate the expiration process. Tracking visitors can be a difficult task. Log books and manually badges have been used for decades, but they don't provide a way to easily access information on past visitors. Sophisticated access-control systems can control every aspect of your identification program, but still can't prevent the badge from being used more than once. TEMPbadge, self-expiring badges are the answer. They use patent technology to visually identify badges that are no longer valid. The front part is applied to the back part to activate the expiration process. TEMPbadge products are available in half day, full day, one week and one month time frames. You can mix and match these badges to suit visitors, temporary workers, contractors, vendors and other guests. TEMPbadge products are easy to use, affective and affordable and best of all, they easily identify when the badge is expired, so there is no need to retrieve your temporary passes or worry about them being used over again. 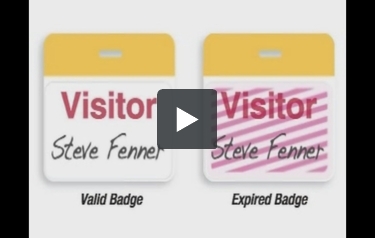 TEMPbadges self-expiring badges make any visitor management program safer. Ask us about which products fit your needs and budget.